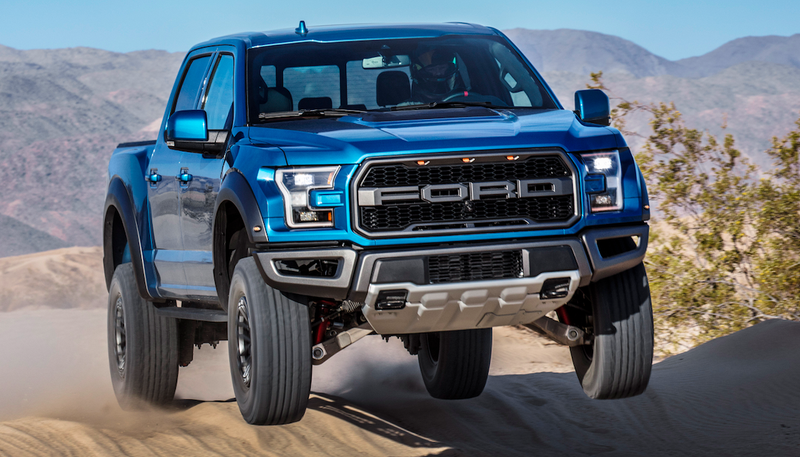 The 2019 Raptor, like the outgoing 2018 truck, gets Fox 3.0-inch internal bypass shocks, except now instead of just adjusting damping based on wheel travel, the shocks feature an electronically-controlled adaptive damping setup called “Live Valve,” which uses various sensors in both the body and suspension to change compression rates real-time. This should mean you can rip through deep ruts at absurd speeds without necessarily bottoming out and shattering your vertebrae. The system works at speeds between 1 mph and 20 mph in both four-wheel drive low-range or high range, with Ford saying the system can “draw significant engine torque to overcome steep obstacles.” In other words, it’s like hill descent control at higher speeds, and meant for terrains other than just downhill slopes. I myself prefer to use my feet instead of letting the computer have all the fun, but after trying Crawl Control on the current generation Toyota Tacoma, I totally understand why others might like it, especially if this system can help the truck get un-stuck from a sand pit like Toyota’s can. Though, if I’m honest, of the two changes for 2019, I’m mostly interested in the adaptive damping, because I want to know just much smoother and more controlled this truck possibly get while blasting through treacherous, uneven terrain. And, the Raptor is now 2 years behind the MMC of the F150. It seems like every other truck commercial includes a shot of some random heavy thing being dropped into a pickup bed: rocks, hay bales, giant novelty weights. Denis Leary is usually talking, or Bob Seger singing. That the truck in question doesn't collapse like a hot marshmallow under the strain is presumably meant to prove it's not a wimpy truck for wimpy guys who can't get girls. Truck, tough, grr. Well, with commercial logic in mind, we can report the 2018 Ford F-150 King Ranch with the new Power Stroke diesel engine option is not wimpy. Even when resplendent in its extra chrome trim and stuffed with a Lincoln's worth of luxury upgrades like massaging seats, the fancy-pants King Ranch proved its tough-truck worth as a front-end loader dumped a half-ton of river rock into the bed. The resulting cloud of dust caught the searing midday sun. I remember it now in slow motion, as if living through one of those commercials. Yup, that's a tough truck. After Senior Editor Alex Kierstein put a 2018 F-150 Platinum and its new Power Stroke V6 to the tow test, it seemed worth the effort to test the hauling capabilities while also sampling a different range-topping variant. Though the equipment levels of the Platinum and King Ranch are comparable, the King Ranch is, well, more ranch-y in its styling elements. The earthy, rust-colored two-tone interior accented by multiple King Ranch squiggle logos (a replica of the actual ranch's cattle brand) remain from earlier versions, but everything is toned down and classier inside and out. The real open-pore wood trim is lovely. I'm actually a big fan of the overall vibe despite not exactly being a belt-buckle, cowboy-boot kinda guy. 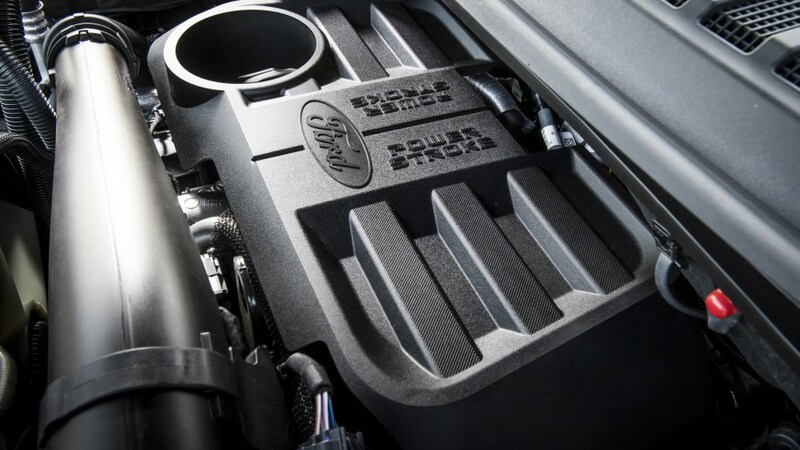 The new Power Stroke diesel engine is a 3.0-liter V6 built in Britain and related to a number of Jaguar/Land Rover products, including the Range Rover and Discovery. "Related" is the key word, as Ford changed the turbocharger, fuel injection system, connecting rod and main bearings, oil pan and crankshaft to make "Power Stroke" more than just a sticker attached to the engine cover. The end result is a diesel mill that produces a stout 250 horsepower and 440 pound-feet of torque. As Kierstein noted, this is an astonishingly quiet application of a diesel engine. Heck, it's an astonishingly quiet engine/truck pairing, period, regardless of fuel. You can occasionally hear a tell-tale turbodiesel whine when the Bang & Olufsen sound system is muted, but the expected diesel roar is never there. You have to roll the windows down for that, and even then, it's not exactly Peterbilt in its decibel level. Paired to Ford's new 10-speed automatic, the Power Stroke is smooth and responsive, and not especially diesel-like in its drivability, either. Clearly, this engine was meant to provide the capability and fuel economy (22 mpg combined as equipped) of a diesel engine without the negative side effects that might otherwise shoo people away. Job well done. As for its hauling capability, the F-150 Super Crew 4x4 has a payload of 1,720 pounds with the Power Stroke. This means I was essentially maxing the truck out with the river rock. I don't have an exact weight of the load, but knowing the basic volume-to-weight measurements indicated I was definitely in the 1,700-pound ballpark. So loaded, there was a slight stutter from the transmission when accelerating from a stop. Presumably this was between the 1-2 shifts, and it almost felt like a driver failing to apply enough throttle when driving a manual transmission. All other shifts were fine, and this was the only indication from the powertrain that we'd just dropped a 1996 Lotus Elise worth of rock in the back. There was no straining from the engine, it just hauled without fuss. 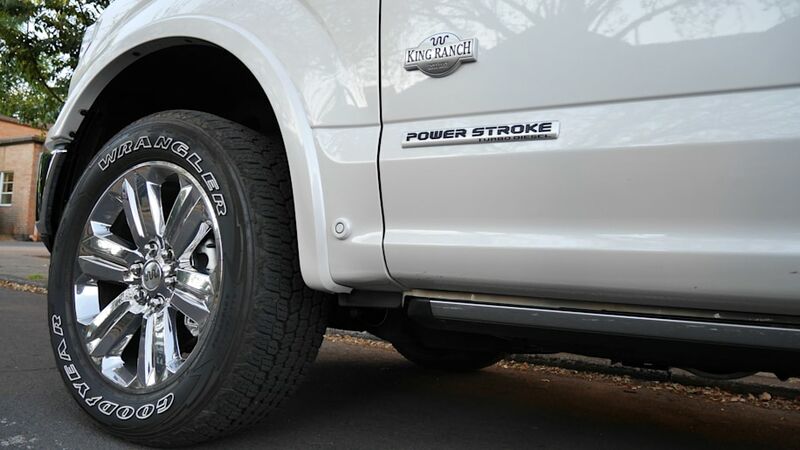 Keep in mind, though, that the Power Stroke is a $3,000 option on the King Ranch versus the standard 5.0-liter V8 (395 hp, 400 lb-ft) and $600 3.5-liter EcoBoost V6 (375 hp, 470 lb-ft) that actually have greater payloads topping 2,000 pounds. Its 4x4 fuel economy of 22 mpg combined compares to the V8's 18 mpg combined and the EcoBoost's 19 – although the Power Stroke may be thriftier in the real world than the EPA numbers suggest, its price premium would still take a long time to pay back. Moving beyond the powertrain, loading up the bed settled down the rear end and therefore improved the ride. When unloaded, the F-150's leaf-sprung rear end isn't as good as the coil sprung 2019 Ram 1500's. The steering also became lighter, but again, that's to be expected, and actually remained vastly better than the at-times spooky steering of past pickups. Fitted to the test truck was the $495 spray-in Tough Bed bedliner option, which is absolutely worth the expense. Though I put down thick plastic sheeting to protect it further, it was no worse for wear after being emptied, swept and hosed out. Impressive. Careful piloting by the front-end-loader operator meant the military-grade aluminum bed exterior remained untested (though it probably would've handled it well). I also had the opportunity to utilize the F-150's "man step" or whatever it's officially called, once again finding it to be a must-have feature. Despite Chevy's sour grapes ads about it, you're not a wimp for using it — it makes getting up to and out of the bed easier, but it also makes for a quicker and therefore more productive working experience. My 5-foot-0 wife was especially grateful for its existence. A guy in the Home Depot parking lot stopped me to note it was a great feature. So there. With the bed painstakingly unloaded, it was soon thereafter repurposed for a considerably lighter hauling task: a two-person river-floating inner tube. The reasonably priced $250 foldable bed-extender proved handy as it did its job extending the Super Crew's 6.5-inch Styleside bed to accommodate the raft, and therefore make it possible to transport it to the Washougal River inflated. Good plan in theory, except our friends' tubes still needed to be inflated and with the F-150's two house-style electric outlets aboard, a quicker, more powerful compressor could be used while still having an extra outlet available for a blender or hair dryer or some manly thing. Belt sander, sure, that works. So whether using it as Denis Leary would narrate, or like a pampered city slicker who needs a $74,295 King Ranch to occasionally haul an oversized inner tube to a river, this F-150 got the job done. It's definitely not wimpy. Neither is the Power Stroke, but after crunching the numbers, the ad men may need to work some magic. The 3.5 V6 EcoBoost is cheaper, gets more HP/TQE, and marginally worse MPG. Thinking the take rate on the PSD is going to be low. Ford’s most luxurious F-150 pickup will also be its most powerful for the 2019 model year. The F-150 Limited will offer the mighty Raptor’s twin-turbo 450-horsepower V6 and a host of new luxury touches. 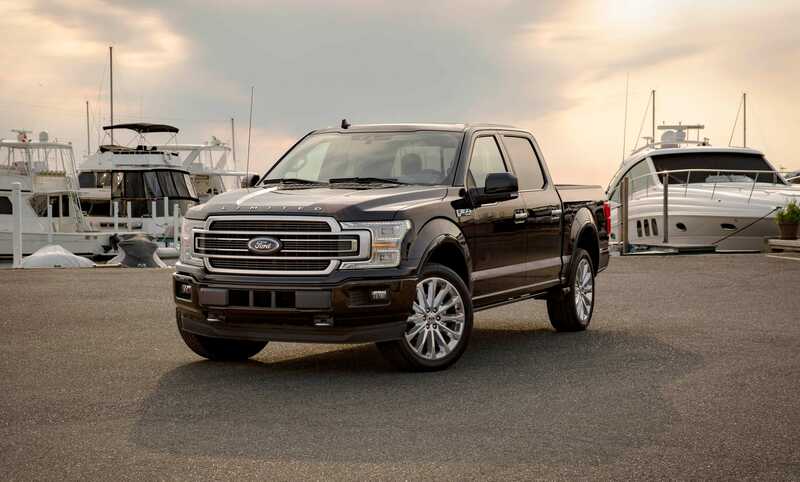 Along with glamourous touches like soft two-tone leather, the 2019 F-150 Limited will be the most powerful light pickup on the road. It’s also one of the ritziest, with interior features and materials to rival a luxury sedan. The 3.5L twin-turbo V6 also produces 510 pound-feet of torque and has a standard 10-speed automatic transmission. The upgrades are designed to help Ford fend off challenges by all-new pickups from Chevrolet, GMC and Ram. Sales of the 2019 F-150 Limited should begin late this year. Pricing hasn’t been announced, but the 2018 F-150 Limited starts at $61,360 and can top $70,000. While the Raptor was developed to race through rugged terrain like Baja California, the Limited oozes luxury. The F-150 has been America’s bestselling vehicle for 35 years. Another hit to PSD sales? Wait, is there no B-pillar on the driver's side? Probably a spliced together photo to show the whole cabin. SCrew definitely has a B-pillar. Oh yeah, the back door would have to be suicide then. True. Sometimes you need to haul your bike and a pickup is a great way to do it. That's why pickup trucks and motorcycles are a perfect match. So it was only natural for Ford and Harley-Davidson to collaborate on a Harley-Davidson F-150 special edition models between 2000 and 2012. But the two companies let their partnership expire with Ford's last Harley-Davidson F-150 in 2012, so now Harley has partnered with custom truck builder Tuscany Motor Co. to create an all-new custom Harley-flavored 2019 Ford F-150 pickup truck as part of Harley's 115th anniversary celebration. Designers took specific inspiration from Harley's Fat Boy model in designing the pickup, which includes milled aluminum 22-inch wheels that mirror similar wheels on the bike. It's also finished with a custom-tuned Flowmaster exhaust, Harley badges and Harley-labeled instruments, aluminum racing-style pedals, two-tone diamond-stitched perforated custom leather seats, and a BDS Suspension lift kit and Fox off-road shocks. Of course, the Harley-Davidson Ford F-150 rolls on larger 35-inch off-road tires, because that's pretty much a must for custom pickups. And that hood scoop is actually functional, so it routes fresh air to the truck's V8 engine. There's no official pricing available yet, but you can place an order through Harleytruck.com. Ford might not be doomed after all. The American automaker has now finally announced that it is going to launch an all-electric version of its most important vehicle program: the F-Series pickup trucks. It sounds like the previously announced hybrid version of the F150 is still planned for production, but it will be followed by an all-electric version of at least one pickup truck in the F-Series. He didn’t confirm a timeline nor which pickup truck in the F-Series – though the F150 is a likely option. It’s one of many EV announcements from Ford over the last week. Ford and VW announced that they are considering partnering on electric vehicles. Lincoln, the American automaker’s premium brand, also announced that it is making an electric car based on Ford’s Mustang-inspired EV. The Mustang-inspired EV is supposed to be Ford’s first all-electric vehicle built to be electric from the ground up and it is due to launch next year. Ford, America's truck leader, introduces the next level of Built Ford Tough heavy-duty pickup truck capability, power and technology with the new 2020 F-Series Super Duty pickup. "Super Duty customers have demanding and diverse needs - from towing heavy trailers to repairing critical infrastructure," said Kumar Galhotra, Ford president, North America. "Productivity is their lifeblood and their truck is their biggest tool. Our new Super Duty has more power, more payload and towing capability and better technology than ever to help these customers build a better world." F-Series Super Duty had the most market share in industries such as government with more than 60 percent share, petroleum with 50 percent share and utility services with more than 45 percent share, according to Ford analysis of IHS Markit TIPet U.S. registration data, January 2017 through November 2018. Assembled in the United States, Ford's F-Series Super Duty is built with pride at both Kentucky Truck Plant in Louisville and Ohio Assembly Plant in Avon Lake. An all-new Ford-designed and Ford-built 7.3-liter V8 joins the standard 6.2-liter V8 in Super Duty's gas engine stable. The Ford-designed and Ford-built third-generation 6.7-liter Power Stroke® diesel V8 is upgraded to deliver more power and torque. An all-new Ford-designed and Ford-built 10-speed heavy-duty TorqShift® automatic transmission is paired with the 7.3-liter V8 and third-generation 6.7-liter Power Stroke® diesel V8. Ford is the only manufacturer to design and build all of its heavy-duty engine and transmission combinations - ensuring the powertrain works seamlessly with all chassis components and vehicle calibrations. "With the addition of the 7.3-liter V8, upgrades to our 6.7-liter and the debut of an all-new 10-speed transmission, we are delivering the strongest, most capable Super Duty powertrain offerings yet," said Mike Pruitt, Ford Super Duty chief engineer. The 7.3-liter gas V8 engine delivers high performance in a compact package. Based on decades of commercial engine experience, this 7.3-liter is expected to be the most powerful gas V8 in its class - providing durability, ease of maintenance, and the towing and payload capability customers want. It uses an all-new cam-in-block, overhead valve architecture with cast iron block and forged steel crankshaft for maximum durability. Port injection with variable-valve timing optimizes the intake and exhaust to match performance with workloads. Oil jets cool the pistons under heavy loads. Super Duty's third-generation 6.7-liter Power Stroke includes a new 36,000-psi fuel injection system with all-new injectors that precisely meter and spray up to eight times per stroke to control noise levels and optimize combustion. This innovative inboard exhaust diesel V8 features a redesigned electronic-actuated variable-geometry turbocharger that provides improved pumping efficiency and throttle response. Structural enhancements increase the strength of the cylinder head, block, connecting rods and bearings to handle higher cylinder pressure and increased output. New steel pistons provide higher firing pressure capability and less friction - meaning improved performance and more horsepower and torque than ever. The truck's standard 6.2-liter gas V8 rounds out the three engine choices for Super Duty customers. This workhorse offers heavy-duty truck customers proven capability at an affordable price. This electronically controlled transmission has selectable drive modes that include normal, tow/haul, eco, slippery, and deep sand and snow. The entire unit is so cleverly engineered that - even with four extra gears - it fits in the same space as the 6-speed and weighs only 3.5 pounds more. For 2020, class-exclusive new Pro Trailer Backup Assist makes negotiating even the largest trailers into the tightest of spaces easier than ever before. With hands off the steering wheel, drivers use the Pro Trailer Backup Assist knob to easily steer the trailer via the reverse camera. The truck's Trailer Reverse Guidance system shows trailer angle and direction, and provides steering suggestions to most efficiently direct a trailer backward. Both systems are built to accommodate all trailer styles, including fifth-wheel and gooseneck trailers. Because today's work is a 24/7 proposition, staying connected is essential. Every new 2020 Super Duty includes FordPass Connect™ embedded 4G LTE modem with Wi-Fi access for up to 10 devices, keeping crews in communication no matter where the job might take them. Available lane-keeping alert helps you stay between the lines on the road, while the Blind Spot Information System with trailer coverage monitors for vehicles in your blind spots - even when towing. Pre-Collision Assist with Automatic Emergency Braking and Pedestrian Detection aids in avoiding or mitigating collisions with other vehicles and pedestrians. 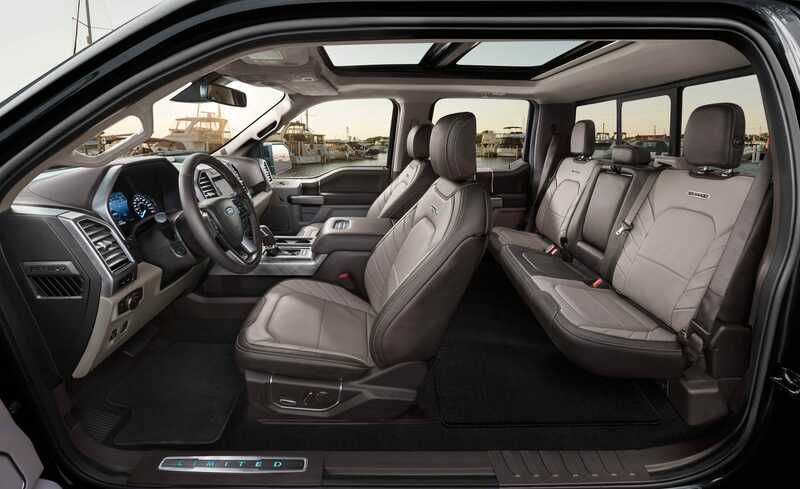 These features are standard on XLT and above Super Duty models. Modern touches include the addition of wireless charging and USB-C ports to power your devices. Super Duty's LED headlamps have a new look with improved performance, while high series trucks feature continuous signature lighting. An improved front bumper and air dam optimize cooling and make using utility hooks easier. A freshened tailgate design, revised taillamps and new rear bumper convey bolder Built Ford Tough style. The new F-Series Super Duty debuts as the most tested pickup in the company's history. It endured more than 12 million miles of testing for the 2017 model year, which was increased by an additional 7 million miles for 2020 to ensure the new Super Duty can stand up to the rigors the most exacting truck customers demand of it. This torture includes running the truck around the clock under the most extreme loads and through all kinds of environmental conditions using dynos, test tracks and public roads. Because the testing surfaces and durability test tracks are so punishing, many of the miles are run using robot drivers that can handle the abuse better than humans to ensure every F-Series truck is Built Ford Tough. 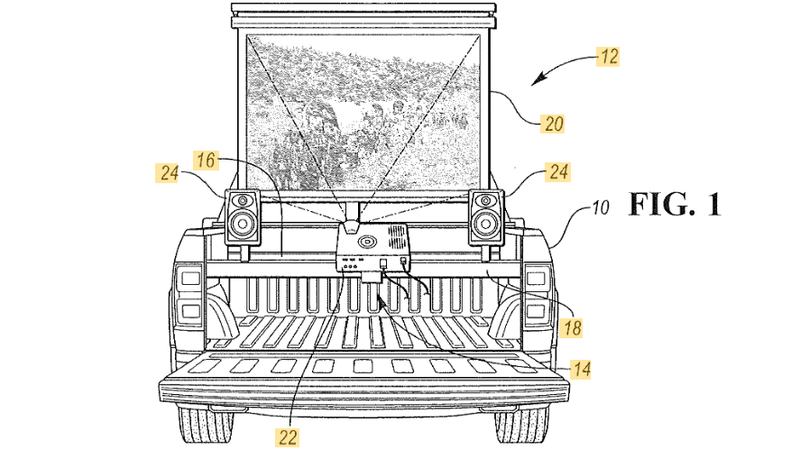 If you’ve always wanted an easy way to turn your pickup truck into an outdoor movie theater, a new Ford patent involving mounts for a screen, speakers, and projector, proposes just that. Check out this incredibly simple idea. 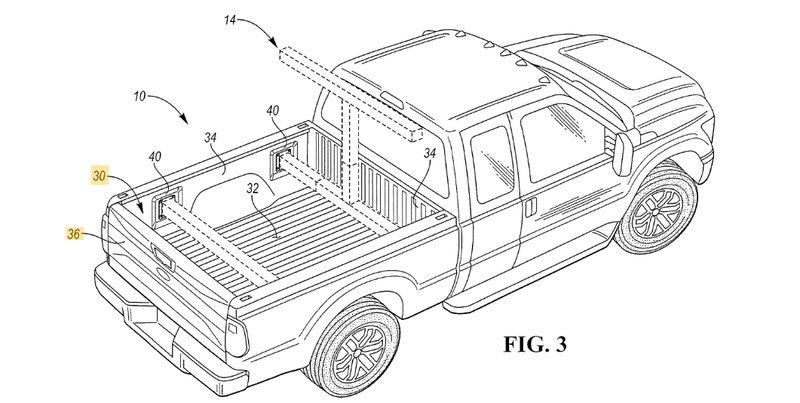 Titled “Portable entertainment support system for a pickup truck box,” the patent, which Ford filed in Aug. 2017 and which was published earlier this year, actually looks extremely basic. 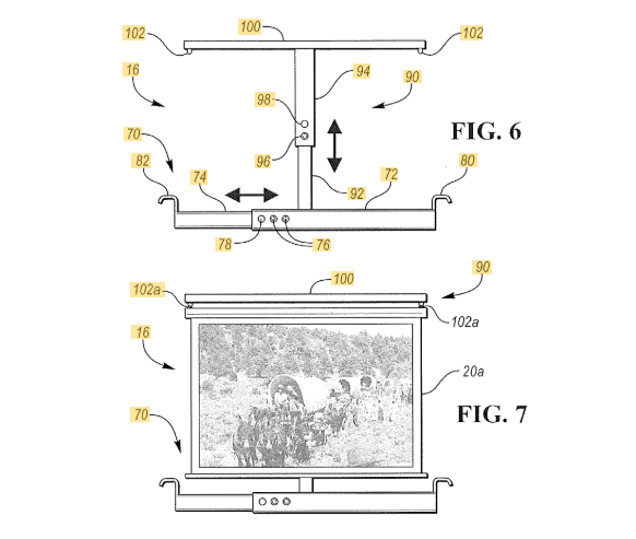 It involves two horizontal, telescoping steel or aluminum arms stretching between, and mounted to, the two inside walls of a truck box, but spaced apart in the fore-aft direction. Some truck owners customize the pickup truck box to provide convenient interface points for tie downs that are used to secure tools, motorcycles, recreation vehicles, containers, or other cargo. 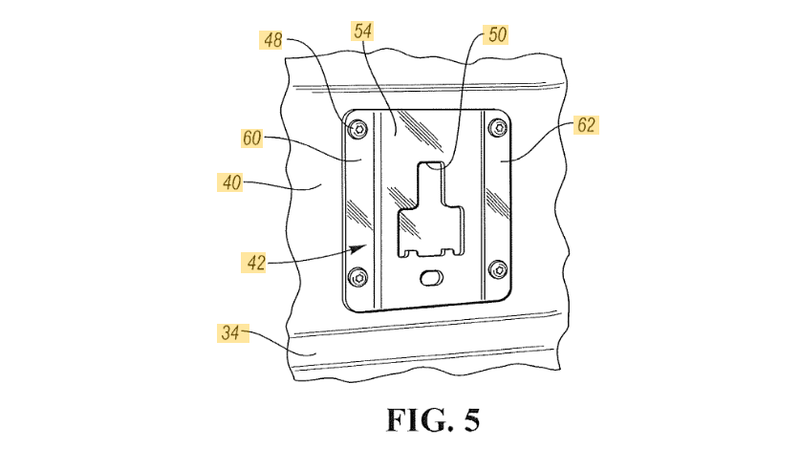 Some pickup truck owners may drill holes in the pickup truck box or use existing holes or other structural features such as edge flanges or the top end of the bed wall to provide interface points for accessories. Drilling holes in a pickup truck box may increase the extent of corrosion, disrupt the integrity, and reduce the strength of the structure. Using existing structural features to secure objects to a pickup truck box may not meet all of a user’s needs and requirements. 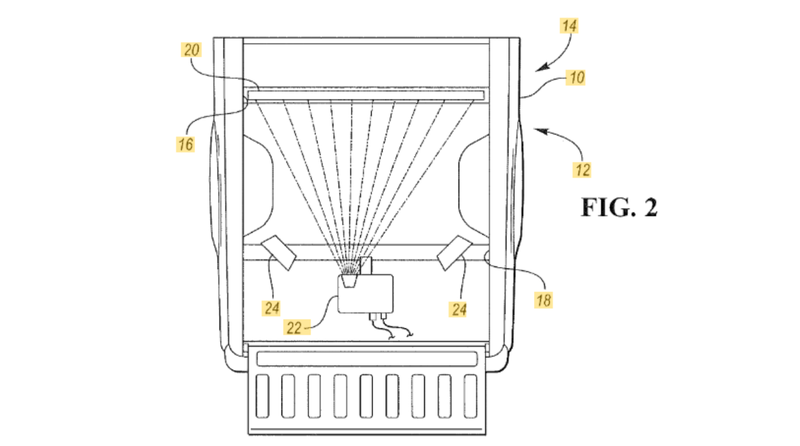 The exact parts shown in this patent, Ford writes, are “merely examples,” and other versions of this idea could look different. 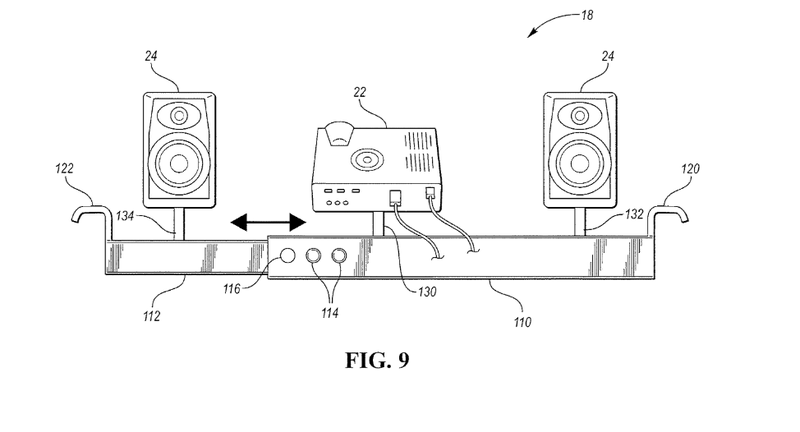 This is an important point, because—even though the idea of bed-mounted receptacles for fastening accessories is a fine enough idea—I wouldn’t consider these metal beams holding audio and video equipment particularly elegant. Celebrity garages can be hit or miss. Not everyone's a car enthusiast, granted, but there's something about getting rich that compels people to fill their driveways with something. That's why you see so many celebs stepping out of identical Lamborghinis and G-Wagens—yawn. And it's why we find ourselves tipping our hat to one Stefani Joanne Angelina Germanotta—aka Lady Gaga—upon realizing that she drives an original 1993 Ford F-150 SVT Lightning. The Venn diagram of The Drive readers and Lady Gaga fans is likely small, so we'll just note that the pop icon is back in the spotlight this year after starring opposite Bradley Cooper in A Star Is Born and charting her first number one hit song ("Shallow," from the movie) in eight years. More germane is the fact that as one of the best-selling artists in history, she's got an estimated net worth of around $300,000,000. Three hundred million dollars can buy literally any car in the world a few times over. Lady Gaga, who only got her driver's license in 2016 at age 30, decided to skip the Rolls Royce dealer and instead grab a mint-condition 1993 Ford SVT Lightning. At most, we're talking $30-40,000 for a time-capsule survivor. For the uninitiated, the SVT Lightning is one of the original factory performance pickup trucks, a lowered F-150 hotted up with suspension upgrades, a 240-horsepower 5.8-liter V-8, and a heavy-duty automatic transmission. Ford built the first run of the SVT Lightning from 1993 to 1995, then brought it back to the tenth-generation F-150 from 1999 to 2004. The original trucks have become something of a cult item since then, and enterprising dealers have been trying to capitalize on that deep-pocketed nostalgia with single-cab special editions designed to evoke the past. Credit to Lady Gaga for picking such an interesting first car and getting one in such amazing condition. The singer and actress has since been photographed in a few other interesting rides, from a Chevrolet El Camino, to a classic Ford Bronco, to a Mercedes-Benz W123 sedan. She's still got the Lightning, though. Paparazzi sometimes catch her behind the wheel, and it makes the occasional appearance on her Instagram page.